CBRE announced the sale of the Eastwind Center, a retail shopping center at 2355-2381 E. Windmill Lane. Charles Moore , CSM, and Marlene Fujita-Winkel , CCIM, of CBRE’s Las Vegas office represented the seller, Passco Eastwind Owner LLC, in the $12,165,000 transaction encompassing 45,240 square feet. The buyer, Rainbow Express Center LLC, was represented by Joshua Michaeli of International Realty LV. The property is situated at the intersection of Windmill Lane and Eastern Avenue and is shadow-anchored by a Smith’s grocery store and a Walgreens. Ajay Khanna Indian Restaurant signed a 63-month lease for 2,400 square feet of retail space at Sunridge Village Plaza at 10960 S. Eastern Ave., Suite 107-108, in Henderson. Ayshe Eyebrow signed a 62-month lease for 800 square feet of retail space at Desert Inn Plaza at 3242 E. Desert Inn Road, Suite 12. Shelter Mutual Insurance Co. signed a 36-month lease for 630 square feet of office space at Spanish Vista Office Park at 4955 S. Durango Drive, Suite 122/159. • CBRE announced the sale of the Eastwind Center, a retail shopping center at 2355-2381 E. Windmill Lane. 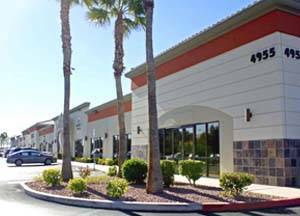 Charles Moore, CSM, and Marlene Fujita-Winkel, CCIM, of CBRE’s Las Vegas office represented the seller, Passco Eastwind Owner LLC, in the $12,165,000 transaction encompassing 45,240 square feet. The buyer, Rainbow Express Center LLC, was represented by Joshua Michaeli of International Realty LV. The property is situated at the intersection of Windmill Lane and Eastern Avenue and is shadow-anchored by a Smith’s grocery store and a Walgreens. • The sale of an office building was completed on April 30. The 4,867-square-foot property is at 229 N. Pecos Road in Henderson. The total value of the transaction was $865,000. Paul and Wil Chaffee and Linda Gonzales of Sun Commercial Real Estate Inc. represented the seller, Compass Bank and ERA Brokers Consolidated represented the buyer, Quang and Loida Nguyen. • The sale of an office building was completed on April 20. The 2,466-square-foot property is at 3175 S. Eastern Ave. The total value of the transaction was $275,000. Paul and Wil Chaffee of Sun Commercial Real Estate Inc. represented the seller, Sommocolonia LLC. • Lightning Tree Tech Ltd. leased 8,485 square feet of industrial space in Patrick Commerce Center at 2875 E. Patrick Ln. Jake Higgins of CBRE represented the tenant. • VP Holdings LLC dba Blow Out Rules leased 1,324 square feet of retail space at 4115 S. Grand Canyon Drive, Ste 102, from Grand Canyon Center LP. Total consideration was $189,791. Managing Director Michael Zobrist and Executive Managing Director Nelson Tressler of Newmark Knight Frank represented the lessor in the transaction. • ARMCO USA Corp. dba Brother’s Italian Pizza leased 1,400 square feet of retail space at 7575 S. Rainbow Blvd., Ste 104, from DM Rainbow LLC. Total consideration was $182,276. Managing Director Michael Zobrist and Executive Managing Director Nelson Tressler of Newmark Knight Frank represented the lessor in the transaction. • John Koutsulis dba Farmers Insurance and DMV Services leased 1,400 square feet of retail space at 1275 W. Warm Springs Road, Ste 150, from Exeter 16290 NV LLC. Total consideration was $115,009. Managing Director Michael Zobrist and Executive Managing Director Nelson Tressler of Newmark Knight Frank represented the lessor in the transaction. • Dollar Loan Center signed a 65-month lease for 2,012 square feet of retail space at Kenny Sunset at 1351 W. Sunset Road, Suite 110. Robert S. Hatrak II of Virtus Commercial represented the lessor, Kenny Sunset LLC; and Mike Boscia of Dapper Cos. represented the lessee in the transaction. 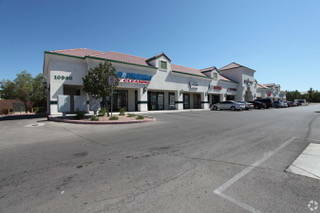 • Nail Therapy Beauty Balance signed a 64-month lease for 1,035 square feet of retail space at 804 S. Las Vegas Blvd. Robert S. Hatrak II of Virtus Commercial represented the lessor, DROCK Investments LLC, and the lessee in the transaction. • Ajay Khanna Indian Restaurant signed a 63-month lease for 2,400 square feet of retail space at Sunridge Village Plaza at 10960 S. Eastern Ave., Suite 107-108, in Henderson. Brett S. Beck of Virtus Commercial represented the lessor, Kwang Ha LLC; and Najia Feda of Realty Edge represented the lessee in the transaction. • Shelter Mutual Insurance Co. signed a 36-month lease for 630 square feet of office space at Spanish Vista Office Park at 4955 S. Durango Drive, Suite 122/159. Matt Feustel of Virtus Commercial represented the lessor, Armen Wardy; and Greg Pancirov of Real Comm Advisors represented the lessee in the transaction. 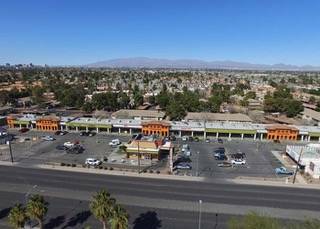 • Ayshe Eyebrow signed a 62-month lease for 800 square feet of retail space at Desert Inn Plaza at 3242 E. Desert Inn Road, Suite 12. Brett S. Beck of Virtus Commercial represented the lessor, Desert Inn Square LLC; and Gary S. Beck represented the lessee in the transaction. • The lease with Supreme Baller Univer-City LLC was completed on April 10. The 9,600-square-foot industrial space is at 4405 Colton Ave., Suites 101-103. The total value of the transaction was $317,568. Sun Commercial Real Estate Inc. represented the landlord, Colton Business Park. • The lease with Taormina Insurance Services Inc. was completed on May 1. The 2,295-square-foot office space is at 5440 W. Sahara Ave., Suite 107. The total value of the transaction was $209,505. Lisa Hauger and Timothy Erickson of Sun Commercial Real Estate Inc. represented the landlord, Sahara Vista LLC. • The lease with Nationwide Insurance was completed on April 17. The 2,315-square-foot office space is at 6787 W. Tropicana Ave., Suite 120-A. The total value of the transaction was $117,740.04. Paul and Wil Chaffee of Sun Commercial Real Estate Inc. represented the tenant, Nationwide Insurance and Northcap Commercial represented the landlord, 6787 Tropicana LLC. • The lease with SSK Holdings LLC was completed on April 9. The 1,414-square-foot retail space is at 5325 S. Fort Apache Road, Suite D. The total value of the transaction was $82,238.24. Rob Moore of Sun Commercial Real Estate Inc. represented the Landlord, DTS-S Fort Apache LLC.